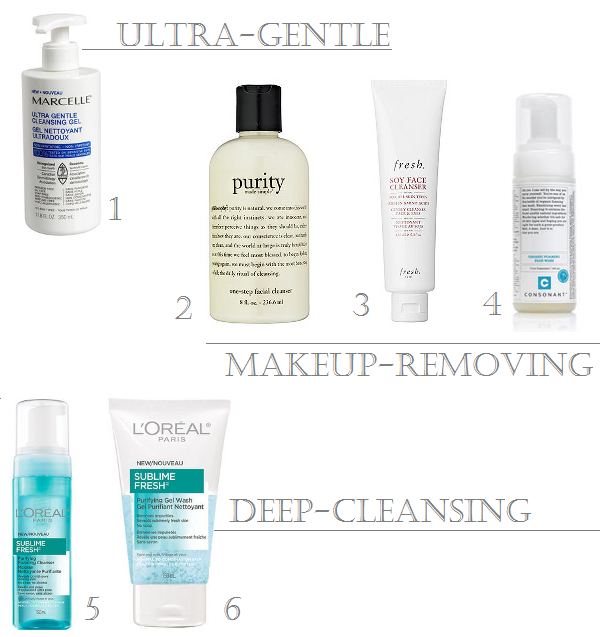 Spring is the season to give our homes a nice, deep clean, so why not do the same for our faces by swapping cleansers? These new and old favourites are gentle on complexions and tough on dirt, oil, congested pores, and makeup. Plus, they're free of irritating manual exfoliants like beads and granules, which means they're ideal for using with a Clarisonic or other battery-powered cleansing brush. 1. Marcelle Ultra Gentle Cleansing Gel ($12.99 at London Drugs). Marcelle's latest cleanser truly lives up to its name with its Cetaphil-like consistency. The hypoallergenic, non-comedogenic formula is recognized by the Canadian Dermatology Association and free of parabens, oil, soap, and fragrance. I suggest using makeup remover wipes beforehand, but otherwise this is ideal for sensitive skin, and at 350 ml for $13, a great value too. 2. Philosophy Purity Made Simple cleanser ($13-52). 2 years later, this multi-tasking wonder—cleanser, toner, and makeup remover—is still one of my all-time favourite cleansers. Effective yet gentle, and perfect for those nights when you want to wash your face in a hurry and crawl into bed as quickly as possible. 3. Fresh Soy Face Cleanser ($17.50-45). I've been looking forward to trying this cleanser ever since hearing Fresh co-founder Lev Glazman rave about it, and it certainly didn't disappoint. The formula smells like cucumber and has a luxurious, cool-to-the-touch gel consistency. Despite the lack of suds, this cleanser effectively melts away mascara, concealer, and BB cream without stinging eyes. My skin was noticeably brighter and more even-toned after the first use, thanks to the soy proteins, cucumber, and rosewater's soothing and nourishing benefits. 4. Consonant Organic Foaming Face Wash ($18 at BeautyMark). Another old favourite, one pump of this organic foaming facial cleanser is enough to wash away all dirt, oil, and makeup without drying skin. No wonder it won in the Best Cleanser category of the Globe and Mail's Globe Style Beauty Awards 2013. 5. and 6. L'Oreal Sublime Fresh Purifying Foaming Cleanser ($11.99 at London Drugs) and Purifying Gel Wash ($11.99 at London Drugs). Formulated for normal to combination skin, these drugstore delights contain salicylic acid to help fight blemishes and leave behind a tingly, refreshed sensation. I prefer the foaming wash over the gel cleanser for its lightness.